The entire Parts Staff here at Schmelz Countryside Saab have done their research when it comes to finding the best tires to match the performance and value you expect for your Saab, and in this case, the all new 9-5 for Model Years 2010 & 2011 and all model years of the 9-7X. The following Continental Tire is the best match for your 9-5 Turbo4 and Turbo6 sedan. Our Saab Staff lead by Bob in Parts and our Service Lane can help you through choosing the right tire for your Saab and will make sure you get the best value on tires mounted and balanced in the Minneapolis / St Paul Area. Book a service appointment with us now, or come down and visit our service center today! 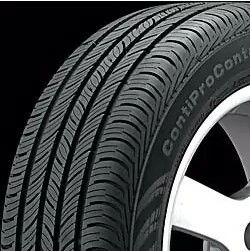 The ContiProContact is Continental’s Grand Touring All-Season tire originally developed for European sport coupes and sedans sold in North America. The ContiProContact is designed to blend good looks and handling with low noise and a smooth ride while providing all-season versatility and year-round traction, even in light snow. The ContiProContact features an all-season tread compound molded into a symmetric, notched-rib tread design that provides continuous tread contact with the road to enhance steering response and handling while its wide circumferential grooves promote hydroplaning resistance and wet traction. Continental’s PROactive Edge Technology places at least 800 arched edges in each ContiProContact tire’s tread design to bring more active edges into the contact patch to promote stormy-weather traction while allowing the pattern elements to transfer smoothly from edge to edge to minimize on-road noise. The tire’s internal structure promotes uniformity and high- Speed durability. 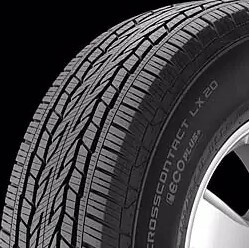 The CrossContact LX20 with EcoPlus Technology is Continental Tire’s ecologically friendly Crossover/SUV Touring All-Season tire developed to help crossovers, sport utility vehicles and light-duty pickup trucks perform on the highway and in mild off-road conditions. The CrossContact LX20 is designed to enhance driving pleasure, save fuel and maintain grip when braking on wet surfaces while providing long wear and all-season traction, even in light snow. The CrossContact LX20 with EcoPlus Technology uses an all-season tread compound featuring Continental’s Tg-F Polymers and +Silane additives to improve treadwear, fuel efficiency and traction on slippery roads. The compound is molded into a symmetric tread design with notched outboard shoulders, independent intermediate tread blocks and continuous center ribs to blend on-road steering response and straight-line stability with reduced noise and enhanced ride comfort. Four circumferential grooves enhance wet traction while Continental’s Traction Grooves (featuring ridges in the outboard grooves) promote three-dimensional snow-to-snow traction. The tire’s internal structure includes twin steel belts reinforced with spirally wrapped polyamide on top of a polyester cord casing to combine strength with ride comfort. Most sizes of the CrossContact LX20 come with a flanged lower sidewall to help reduce the possibility of curb damage to expensive wheels.